San Sebastian de Garabandal is a small hamlet of some 80 humble dwellings in the Cantabrian Mountains of northwest Spain. From June 1, 1961 to November 13, 1965, a Lady appeared to four young girls of the village. During this four-year period, an extraordinary number, over 2,000, of apparitions occurred, some lasting a few hours. The four girls (Conchita Gonzales, Mari Loli Mazon, Jacinta Gonzalez, and Mari Cruz Gonzalez) were eleven and twelve years old at the time. While praying on the outskirts of the village, they heard a sound like thunder. Suddenly, there stood before them a dazzling angel. He said nothing and quickly disappeared. Pale and visibly shaken, the girls ran to the village church, and the apparition soon became known. Over the next twelve days, the angel appeared to them several more times, and on July 1, he spoke for the first time, announcing that on following day the "Blessed Virgin" would appear to them. News spread quickly, and numerous visitors joined the villagers to witness the event. At about six o'clock p.m., the children were headed for the spot, where they had been seeing the angel, when the Blessed Virgin appeared with an angel on each side. They recognized one of the angels as the one who had been appearing to them. Above the Virgin was a large eye that the children thought to be the eye of God. 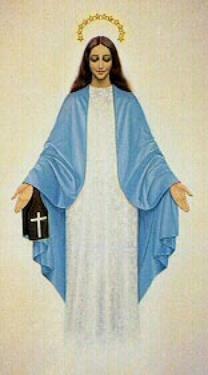 They spoke openly and familiarly with the Lady and said the rosary in her presence. Over the next year and a half, she would appear hundreds of times. OCTOBER 18, 1961: "Many sacrifices must be made. Much penance must be done. We must be very good. If we do not do this, punishment awaits us. Already the cup is filling, and if we do not change we shall be punished." JUNE 18, 1965: "As my message of October 18 has not been complied with and has not been made known to the world, I am advising you that this is the last one. Before, the cup was filling up. Now it is flowing over. Many cardinals, many bishops and many priests are on the road to perdition and are taking many souls with them. Less and less importance is being given to the Eucharist. You should turn the wrath of God away from yourselves by your efforts. If you ask His forgiveness with sincere hearts, He will pardon you. You are now receiving the last warnings. I love you very much and do not want your condemnation. Pray to us with sincerity and we will grant your requests. You should make more sacrifices. Think about the passion of Jesus." A worldwide warning to be experienced by everyone on earth. Its purpose will be to call humanity to amend its behavior and return to God. A great miracle that will occur in the late winter or early spring within one year after the warning. Permanent signs that will remain for all time at a pine grove near Garabandal and other selected locations of Marian apparitions. A terrible chastisement during which many will die. Other prophecies indicate that this chastisement will eliminate up to two-thirds of humanity. The chastisement depends upon the response of humanity to the warning and the miracle. Conchita has stated, "The Warning, like the Chastisement, is a fearful thing for the good as well as the wicked. It will draw the good closer to God and warn the wicked that the end of times are coming." In describing the warning, Jacinta has said, "The Warning is something that is seen in the air, everywhere in the world and is immediately transmitted into the interior of our souls. It will last a very little time, but it will seem a very long time because of its effect within us. It would be like fire. It will not burn our flesh, but we will feel it bodily and interiorly." She goes on to describe astronomical phenomena: "like two stars -- that crash and make a lot of noise, and a lot of light -- but they don't fall. It's not going to hurt us but we're going to see it and, in that moment, we're going to see our consciences." 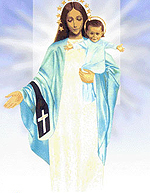 An image of the Virgin Mary as seen by the seers at Garabandal. "It would be worse than having fire on top of us - fire underneath us and fire all around us. She saw people throwing themselves into the sea, but instead of putting the fire out it seemed to make them burn more." "The punishment is conditional upon whether or not mankind heeds the messages of the Blessed Virgin Mary." "If the world changes, the chastisement can be averted." In addition to these events, Conchita has stated that she was told by the Blessed Virgin in 1962 that after the death of Pope John XXIII, "There would be two more popes after Pope Paul VI and that one of the popes would have a very short reign. After that would come the end times but not the end of the world." If Conchita has interpreted this vision of Mary correctly, then Pope John Paul II is the last of the popes before the end times begin. Conchita said that she has been given the date of the Miracle by the Blessed Virgin and will announce the date eight days before it is to occur. Since the Miracle will occur after the Warning, it is highly likely that both the Warning and Miracle will occur within the next thirty years given Conchita's present age (late forties) if this apparition is valid. Conchita has said through her Diary, "I am the only one to whom the Blessed Virgin spoke of the miracle. She forbade me to say what it will consist of. I can't announce the date either until eight days before it is due to occur. What I can reveal is that it will coincide with an event in the Church and with the feast of a saint, martyr of the Eucharist; that it will take place at 8:30 on a Thursday evening; that it will be visible to all those who are in the village and surrounding the mountains; that the sick who are present will be cured, and the incredulous will believe. It will be the greatest miracle that Jesus will have performed for the world. There won't be the slightest doubt that it comes from God and that it is for the good of mankind." On September 14, 1965, Conchita said, "The sign that will remain forever at the pines is something we will be able to photograph, televise, and see, but not touch. It will be evident that it is not a thing of this world but from God." At another time, concerning the great miracle she added, "It would last about 15 minutes." On August 10, 1971, while talking to a group of Americans, she offered this revealing information: "It will take place on or between the eighth and sixteenth of March, April or May. It will not happen in February or June." Eight days in advance of the miracle, Conchita will give notice to the world about its coming. Prior to the eight-day notice, God will send a warning to the entire world to purify it for the great miracle. Therefore, the world will receive two advance notices: the warning and the eight-day notice. Conchita Gonzalez (January 1, 1965) "Our Lady said that a warning would be given to the entire world before the miracle in order that the world might amend itself. It will come directly from god and be visible throughout the entire world." "This warning, like the chastisement, is a very fearful thing for the good as well as the wicked. It will draw the good closer to God and it will warn the wicked that the end of time [not to be confused with the end of the world] is coming and that these are the last warnings. No one can stop it from happening. It is certain, although I know nothing of the day or the date. "The warning will be like a revelation of our sins, and it will be seen and experienced equally by believers and non-believers and people of any religion whatsoever. Each person on earth will have an interior experience of how they stand in the light of God's Justice. It is like a purification for the miracle. And it is like a catastrophe. It will make us think of the dead, that is, we would prefer to be dead than to experience the warning. The warning will be recognized and accepted by the world as a direct message from God. Jesus will send the warning to purify us so that we may better appreciate the miracle by which he clearly proves his love for us and hence his desire that we see the consequences of the sins we have committed. I think that those who do not despair will experience great good from it for their sanctification. "The warning is something supernatural and will not be explained by science. It will be seen and experienced by all men all over the world and will be a direct work of God. It will be very awesome. However, if men die from it, it will be only from the emotional shock of seeing it. It will be a correction of the conscience of the world. Those who do not know Christ (non-Christians) will believe it is a warning from God." "The Warning is something that is first seen in the air everywhere in the world and immediately is transmitted into the interior of our souls. It will last for a very little time, but it will seem a very long time because of its effect within us. It will be for the good of our souls in order to see in ourselves our conscience; the good that we have failed to do, and the bad that we have done. Then we will feel a great love towards our Heavenly Parents and ask forgiveness for all our offenses. The Warning is for us to draw closer to Him and to increase our faith. therefore, one should prepare for the at day, but not await it with fear. God does not send things for the sake of fear but rather with justice and love. He does it for the good of all His children so they might enjoy eternal happiness and not be lost." "We will see it and feel it within ourselves and it will be most clear that it comes form God. " "The Blessed Virgin advised me of a great miracle, saying that God, Our Lord, would perform it through her intercession. Just as the chastisement will be very, very great, in keeping with the needs of the world. The Blessed Virgin has told me the date of the miracle and what it will consist of. I am supposed to announce it eight days in advance, so that people will come. The Pope will see it from wherever he is, and Padre Pio also (he is reliably reported to have seen the miracle before he died). The sick who are present at the miracle will be cured and the sinners will be converted. It will coincide with an event in the Church and with the feast of a saint who is a martyr of the Eucharist, and it will take place at eight-thirty on a Thursday evening. It will be visible not only to all those who are in the village but also to those in the surrounding mountains. It will be the greatest miracle that Jesus has performed for the world. There won't be the slightest doubt that it comes from God and that it is for the good of mankind. There will be no doubt in the mind of anyone who sees this great miracle which God, Our Lord, will perform through the intercession of the Blessed Virgin. And now as we await this great day of the miracle, let us see if the world changes and the chastisement is averted." "The miracle will take place within one year after the warning."